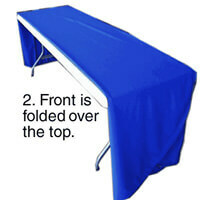 Folding table covers before storage or transport is always a good idea. While our polyester fabric is the most wrinkle-resistant fabric, it still helps to handle it with a little care. 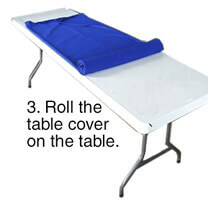 Here's three folding table covers steps, which gets easier with a little practice. Start by folding the back, (if you have one), across the top. Fold the front back across the top. Pull the end up onto the table and roll. 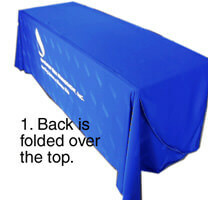 For additional protection, also get a table cover carrying bag for your table cover.